During late autumn these alien-like flower panicles appear, topped with creamy white spherical flowers, which are great food for any pollinators still out and about. 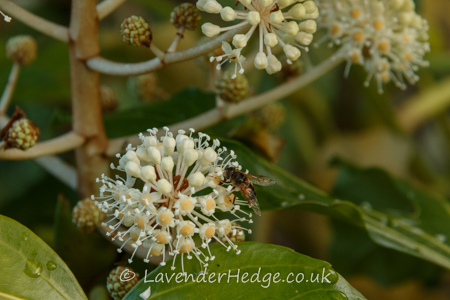 The flowers are similar to the flower spikes of common ivy (Hedera helix), but much larger. Quite often the flowers are followed by black fruit. Fatsia japonica is an unfussy shrub which grows well in most soils (including heavy clay), although it prefers a sheltered position (next to a wall is ideal). Do not be alarmed if some of the leaves go yellow and drop off, this is quite usual, and new leaves will replace them. If it starts looking a bit leggy and bare, I prune the unsightly stems back which encourages new growth. Likewise if it starts outgrowing its allotted space, it gets pruned with no ill-effects. 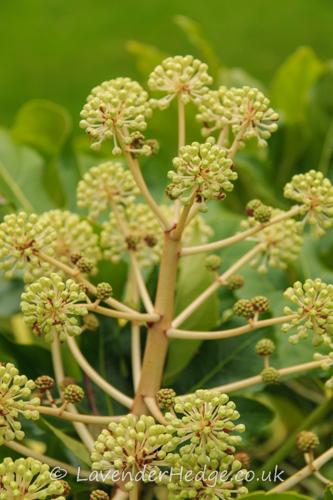 Other names for Fatsia japonica are: Japanese aralia, fig-leaf palm, paperplant or castor oil plant (although incorrectly, as this is the name of Ricinus communis).